30 Oct Rain maintains price gains. The patchy rain continued this week and so did the price rises. 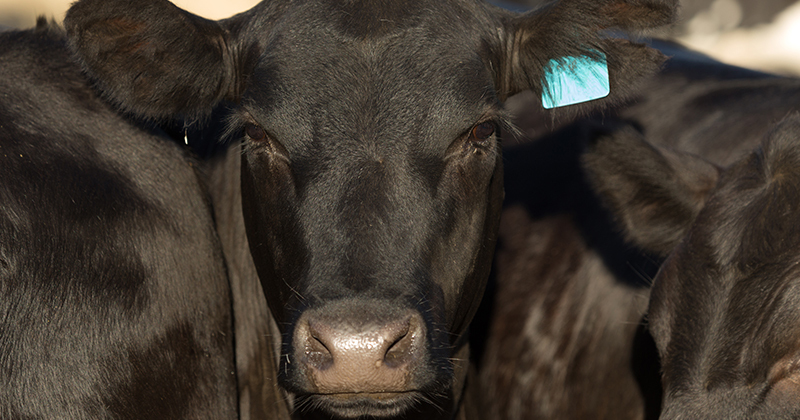 The Eastern Young Cattle Indicator (EYCI) is following a similar trend to last year. In 2017 the October rally lasted through until the end of the year. There is a good chance we are going to see a similar trend this year. This week’s rain tipped the month to date total over the average for much of the northern half of NSW and south east Queensland. For cattle markets, it saw further increases. The 22¢ lift in the EYCI saw the market hit a six month high of 541¢/kg cwt. NSW was the epicentre of the price rises, with CTLX, Tamworth, Singleton and Gunnedah all recording average young cattle prices higher than 560¢/kg cwt. It was Victoria’s turn to languish though, with Barnawatha the only yard to record a price above 500¢. A few weeks ago, in an article on what would happen if it rained, we put the red arrow on Figure 2. It’s nice to be right sometimes, but had export prices managed to hold their ground we’d have pegged the market for more upside. The weakening Aussie dollar hasn’t managed to support a tanking 90CL price in the US. In US terms our export beef is down 13% on this time last year. 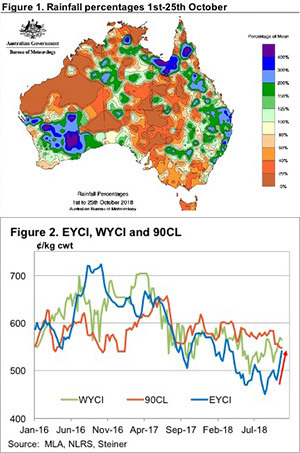 In the West, the wet October has reached some of the south west cattle country, and we can see the impact on the WYCI. Cheaper grain also helps WA maintain a premium to east coast values. More rain should equal more price rises. The best forecast is for central Queensland, which should have some positive price impacts. While manufacturing beef export prices are lower than this time last year, higher value cuts seem to be maintaining good prices. The supply of finished cattle won’t improve with rain, it takes a bit longer, so we can probably expect stronger values to last until the end of the year and translate into support for young cattle.